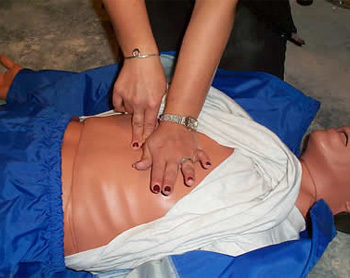 Maple House Clinic offers a number of courses and educational workshops for the general public, including first aid courses. The courses are run by Nigel Morgan, who has over 12 years experience in Health, Fitness, and Therapy. The range of courses are ideal for both industry and public and are a great chance to learn more about a number of subjects. For any enquiries, please call 01773 530268 or Nigel Morgan on 0781 606 8696. A one day 6 hour course covering the essential emergency skills, including, CPR (infant, child & adult), Choking (infant, child & adult), control of bleeding and shock management. This meets the recommendations of the HSE for Appointed Persons. A two day (12 hour) course specifically for any one working in a paediatric environment. This includes all the essential skills from the one day course, and additional knowledge skills specific to children. The qualification is approved by the National Child Minding Association (NCMA), Pre-school Learning Alliance (PLA) and meets the requirements of OFSTED. A 6 hour workshop for Parents, Carers, Grandparents and Nannies. A course teaching you the skills to safely apply massage to babies. Learn to apply massage movements and be aware of the safety factors also involved. During the workshop practice will be done on child and baby mannequins, (as babies will not cope with being disturbed all day). This Back Care educational programme will provide individuals with the skills to help themselves manage their symptoms, rather than be totally reliant on others. Each candidate has a private consultation before attending the course, and exercise sheets are provided to help guide you when away from the course. A range of 1 day (6 hour) workshops, including; Muscle Energy Techniques (MET), Trigger Points, Soft Tissue Release (STR), and Hands Free Massage.